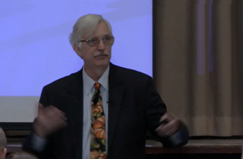 At the October 29, 2013 Round table, keynote speaker, Dr. Chris Dede describes the importance of ‘life-wide’ learning in preparing students to succeed in a world with a variety of social media, mobile devices and immersive technologies. This video highlights the role of school leaders and the importance of having strong teaching and assessment practices in place, and how technology supports and enhances these practices. Students shift from content consumers to content creators. This video highlights their Futures Forum project where grade 10 students use technology to support an inquiry-based, cross-curricular, project-oriented approach to their learning. Click on image to view the video. Click on video title for a transcript of the segment.